Humans grow hair all over their bodies, except in two places: the palms of our hands and the soles of our feet. Some of our hair is long, while other types of hair are thick. Some hairs are so small and fine that they are practically invisible to the naked eye. However, all hair grows in the same way. As the hair follicles produce new hair cells, the old cells get pushed out at an average rate of six inches each year. The hair that is revealed through this process is actually a string of dead keratin cells. As a result of the growth cycle, most adult humans lose between 100-150 hairs a day, but if you see more than that you will want to learn how to stop hair loss in New Bedford before it progresses too far. When you look at the hair on your head, approximately 90 percent of the hair that you see is growing. Each hair follicle has its own unique life cycle, which means that everything is growing and falling out in a variety of time frames. The life cycle of each hair follicle can be influenced by a number of outside factors, including environment, age, and disease. The three phases of hair growth include Anagen, Catagen, and Telogen. If any of these phases are interrupted for any reason, New Bedford hair loss can increase. 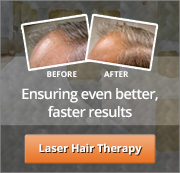 It is important to diagnose the cause of hair loss in order to find hair loss treatments that work. The Anagen phase is when hair is actively growing, which lasts between two to six years. The Catagen phase is a period of transitional hair growth that can last anywhere from two to three weeks. The Telogen phase is a resting phase that lasts between two to three months. At the end of this phase, the hair falls out, and a new hair replaces it, so the growing cycle starts all over again. As people get older, the rate of hair growth can slow. There are many different reasons why people might lose hair abnormally, based on health and other things in their lives. Your cause for Southeastern Massachusetts hair loss can be genetic, or it can be a unique combination of other influences. Before treatment can occur, a diagnosis must be made. The difference between our Greater Boston hair loss clinic and other hair loss clinics is that we do not provide a one-size-fits-all solution to our clients. Because there is no one cause for hair loss, it makes sense that there is no one single solution. To stop hair loss in New Bedford and get your life back on track, it pays to start with a visit to meet with one of our technicians. Our team will provide a free evaluation of your hair and scalp, taking into account your own personal rate of hair loss and any other underlying conditions. Once a diagnosis has been made, treatment can be provided. This is why South Coast Hair Options can offer hair loss treatments that work while other clinics just waste your time and money. One of the most common causes of hair loss is alopecia. While different for men and women, there are many similarities. Involutional alopecia is a natural type of hair loss that involves the thinning of hair gradually over time with age. As more of your hair follicles go into a resting phase, the hair that remains becomes shorter and decreases in number. 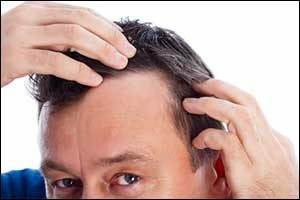 Androgenetic alopecia is the condition most widely known as male pattern baldness, however, it can also affect women. Men can begin to see signs of this type of New Bedford hair loss in their late teens or early 20’s, however, it is most common in the late 30’s to early 40’s. Alopecia areata can start all of a sudden, resulting in patchy areas of hair loss. It can occur in children and young adults, sometimes resulting in total baldness. However, the good news is that this condition will naturally stop hair loss in New Bedford in about 90 percent of the cases and regrow hair within just a few years. The final type of alopecia that we are going to highlight here is alopecia universalis. This type of hair loss can cause all body hair to fall out, including eyelashes, eyebrows, and even pubic hair. It is very rare and is entirely different than the more common androgenetic alopecia, which is a hereditary condition. Whether you suffer from trichotillomania, telogen effluvium, or have hair loss due to a disease or health condition, our team can help. Our Corrective Hair Solutions (CHS) program is designed to provide complete results for 100 percent of our clients. Give us a call at 508-995-7085 and schedule an appointment for a comprehensive scalp evaluation and diagnosis. If you have any degree of Southeastern Massachusetts hair loss come to South Coast Hair Options to try our hair loss treatments that work.